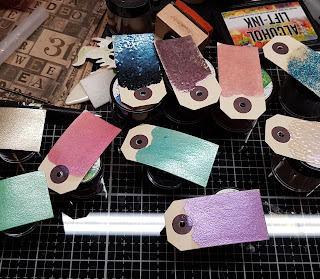 A blog with projects made with Ranger Ink, Emerald Creek Craft Supplies and other products and inspired by Tim Holtz and various other artists. I know I know it has been ages since I last posted. Life and the holidays happened and before that I moved my entire craft space into a new room. 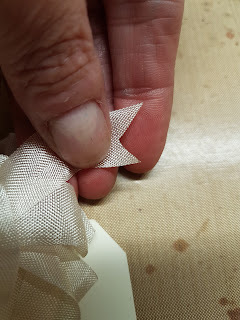 Anyhooo, as people keep asking how I make my fluffy bows, I decided to do a new tutorial, as the first one dated back to 2014! 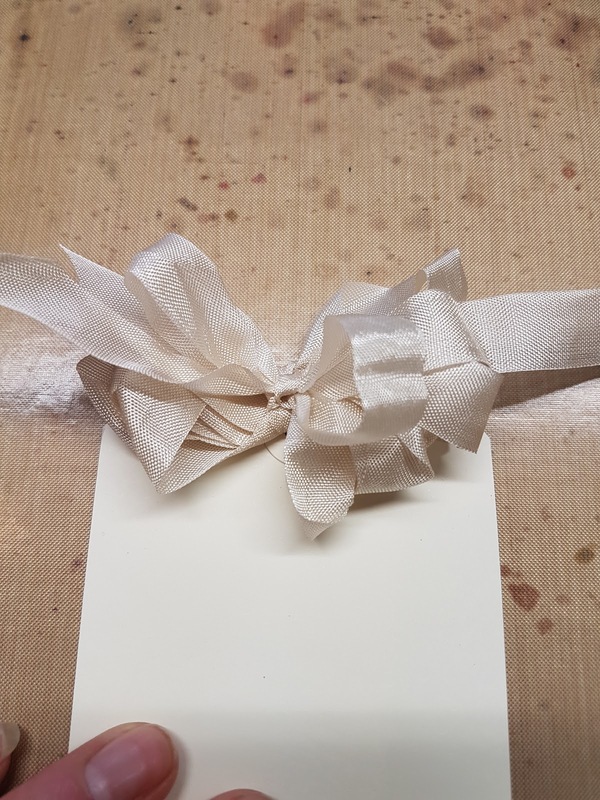 To keep it simple and easy to see, I used a blank tag and uncoloured ribbon, I always stain my ribbons to match my projects. 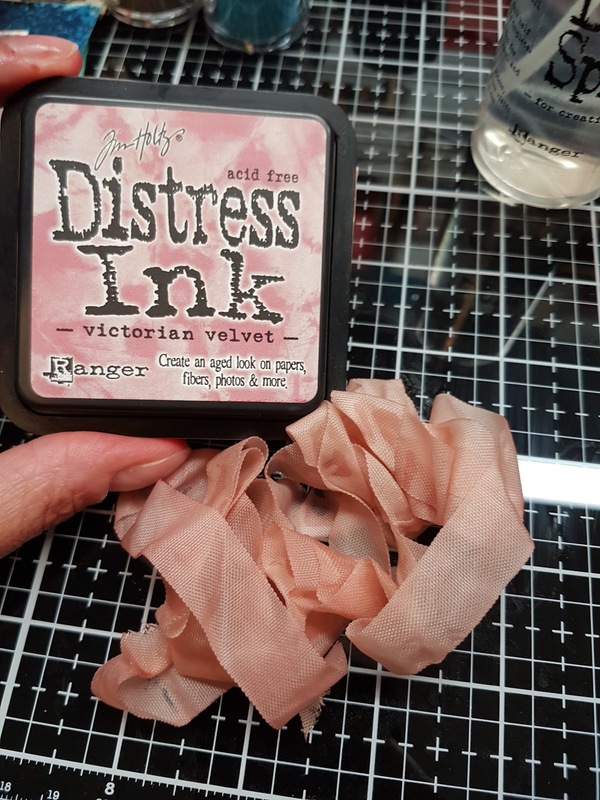 I use Tim Holtz' crinkle ribbon for my ribbons, but as that is discontinued, you can use silk rayon seam binding, available at sewing shops. 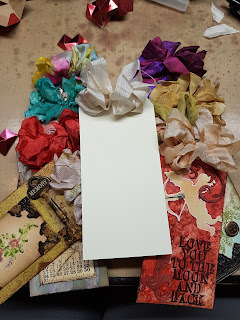 My big love is tags, I must admit that I have strayed to cards lately, but still tags are my favourite to work on. I start by wrapping the ribbon around my hand like this for about 7 times and cut it. I always keep a huge jar on my desk, filled with pre cut pieces of ribbon. 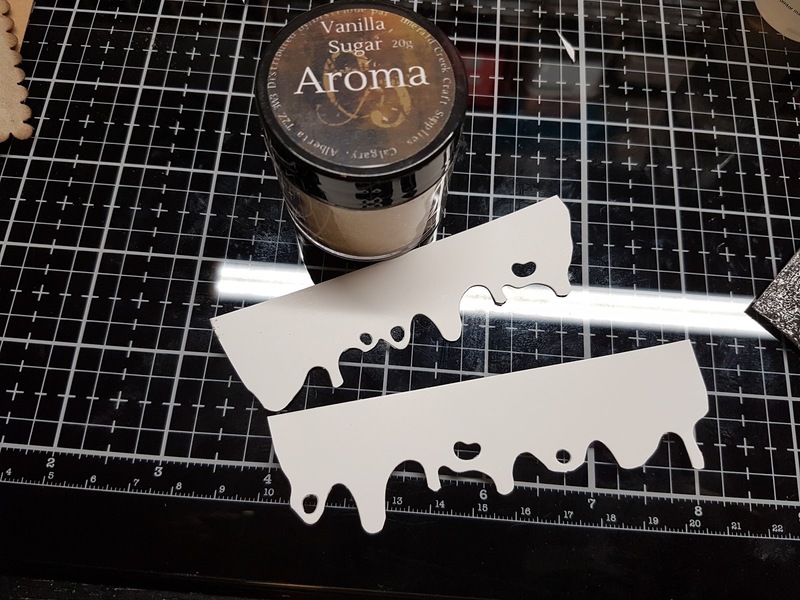 That way I just have to reach into my jar, pull a piece out and stain it or stamp on it and use it on my cards or tags. Thread the ribbon through the hole of the tag and cut a piece off, long enough to tie a simple bow. This is the "cheating" part *wink wink*. 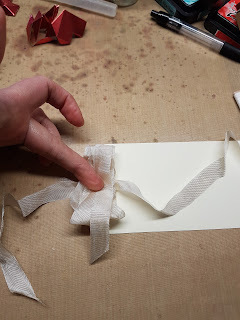 Now slide the loops off your hand and put them on the threaded hole of the tag. Next step is tying a ribbon on top of this, with the piece you threaded through the hole of the tag. To fluff your bow just pull the loops apart and it will get nice and fluffy. For the final touch cut any ends of the ribbon by folding it in half and snip. This will create nice swallow tail ends to your bow. Here a small selection of fluffiness lol. I stain my ribbons with distress inks, distress markers or distress inks/oxides. This way your ribbons always match your project. 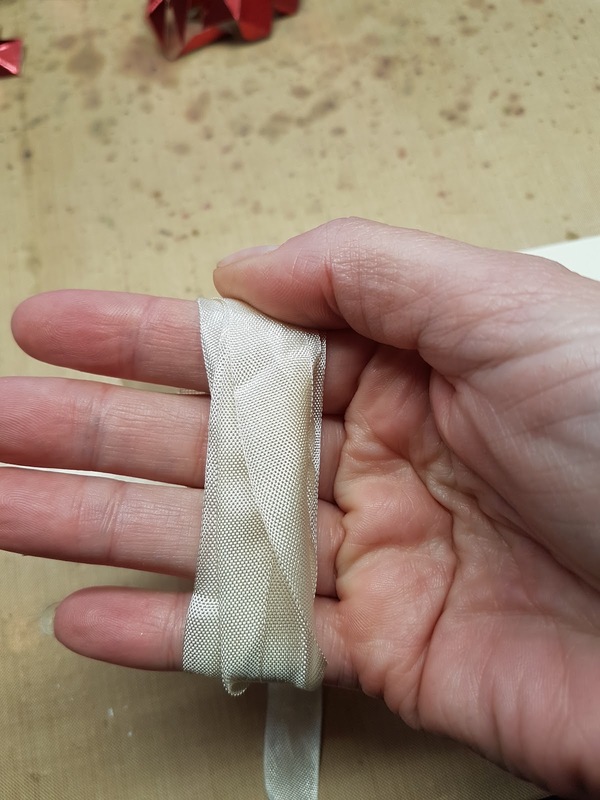 Take care and keep your craft on! 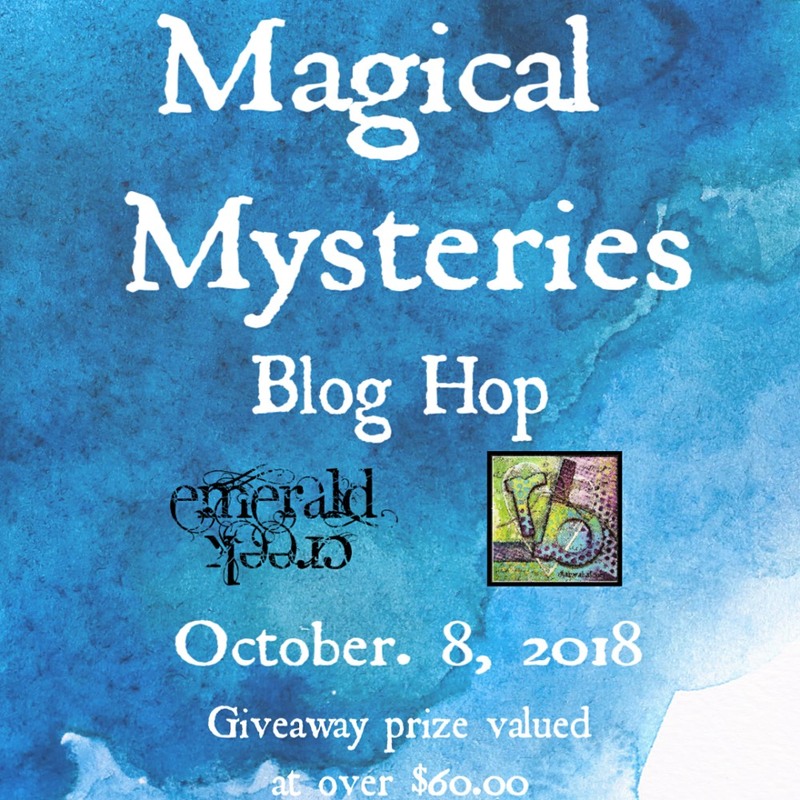 I am excited to have been invited to join the Magical Mysteries Blog Hop for the new embossing powders from Rita Barakat and Emerald Creek. And they are Magical and Mystical indeed! The powders have an iridescent sheen or shimmer and give your project a magical look. 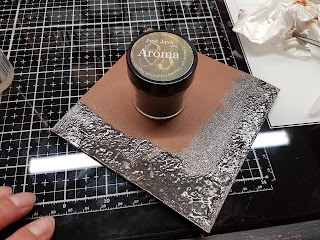 As I had trouble deciding what project to make for this blog post, I decided to do both of them, to show you the versatility of the powders. 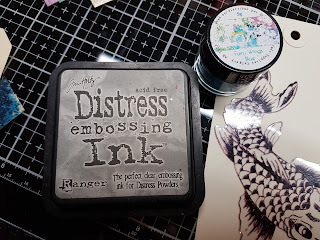 So you will have to excuse the lengthy post, but I assure you, if you love embossing powders as much as I do, it is worth the read ;-). And be sure to visit the other participants of the hop for more inspiration! When I get new powders I always make swatches of them. This way I can see instantly what effect I am looking for. 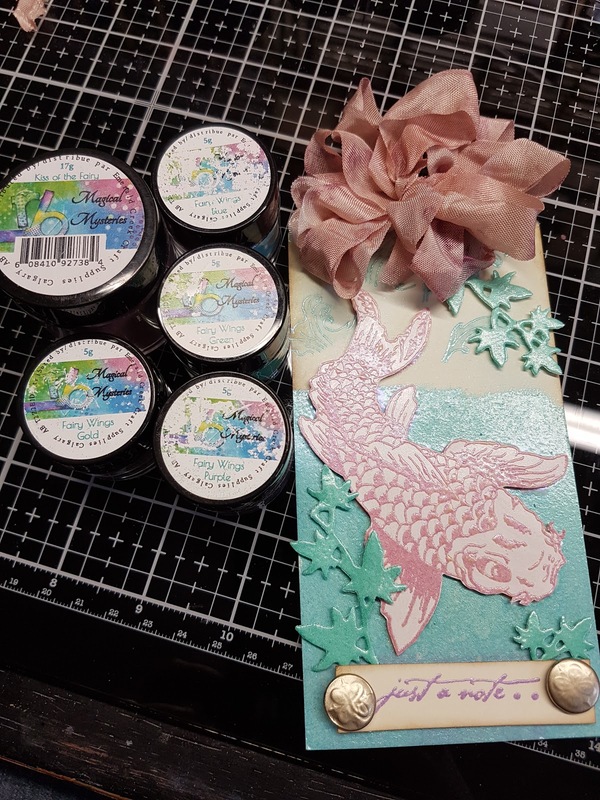 These are the glorious powders I got to work with for this blog hop. 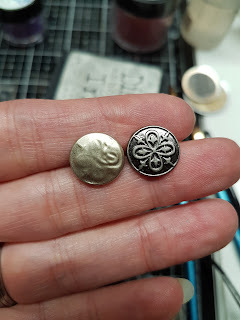 This is the first project I made using no less than 5 of the Magical Mysteries powders. I will show you the step by step. 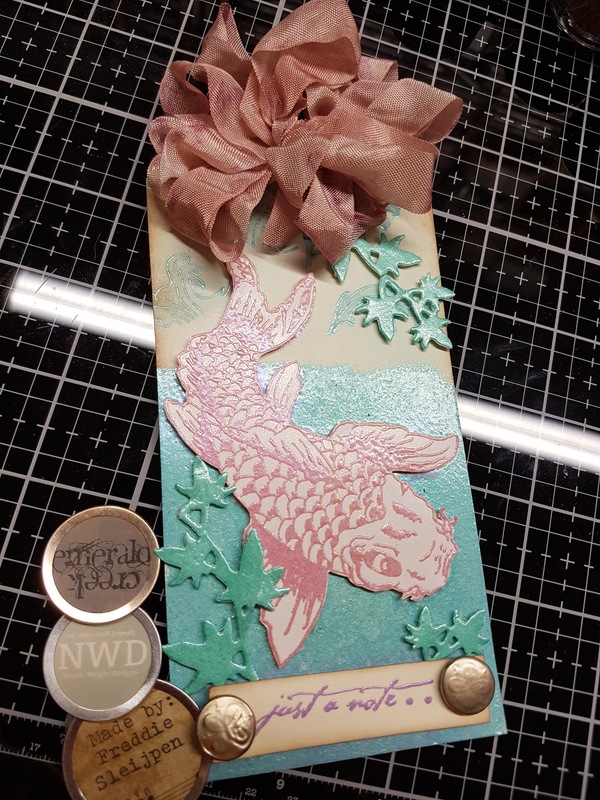 I stamped the koi on a tag, a stamp from the Upstream set by Nicole Wright Designs for Emerald Creek. I used the Kiss of the Fairy, a perfect mix of pink and iridescent powder. 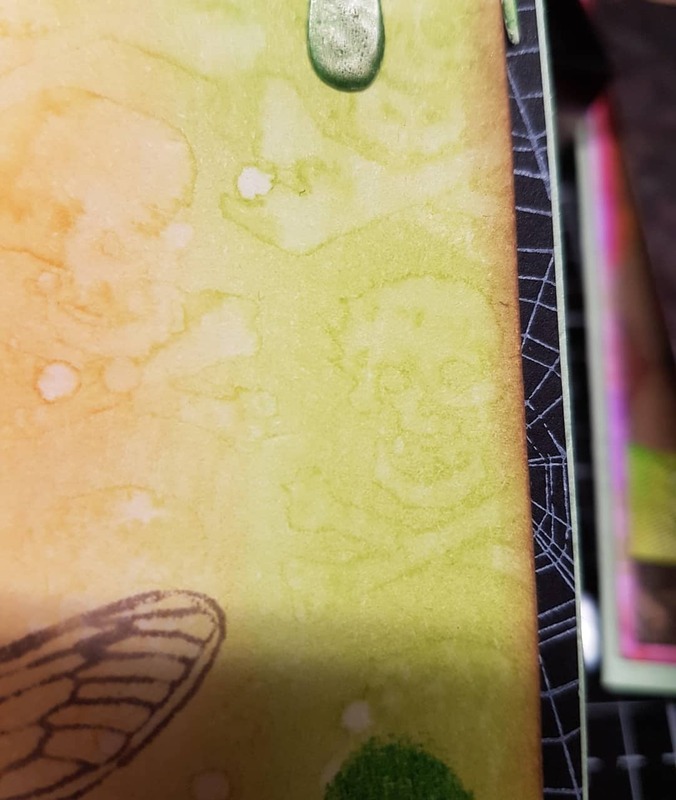 I covered it with a mask so I can ink over it, without covering the stamped image. 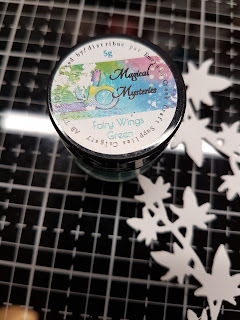 I inked over it with embossing ink and heat embossed it with the blue of the Fairy Wings kit. It has a beautiful metallic sheen to it. The coloured powders in the fairy wings kit, are an iridescent chunky powder, and jars with fine green, purple, pink, blue and gold powder. I used the blue to emboss the waves also, they too are from the Upstream set. 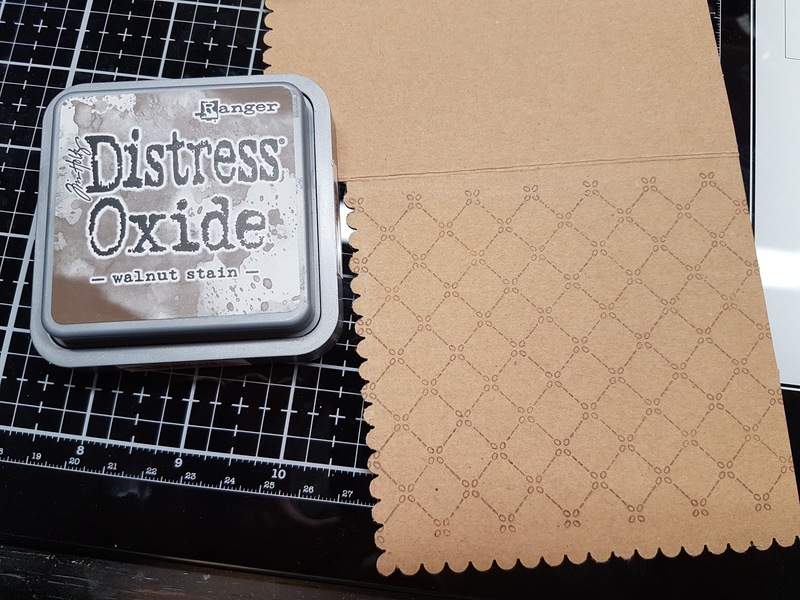 You may or may not know this, but you can heat emboss metal embellishments. 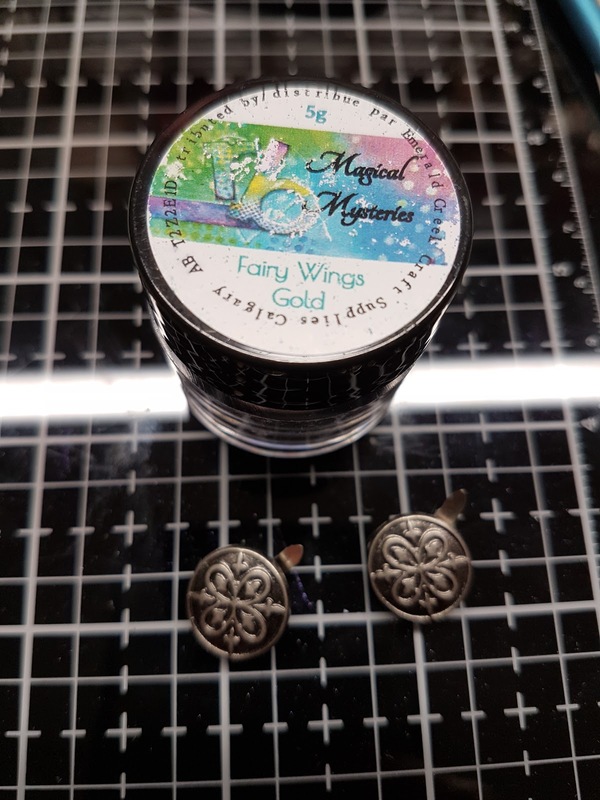 I wanted to give these metal brads, the Fleur Crest from Emerald Creek, a different look, so I held them with tweezers and heated them up and dipped them lightly in the jar of the Fairy Wings Gold powder and watched it melt. I stamped the sentiment Just a Note, also from ECCS, and embossed it with the Fairy Wings Purple. I inked the edges and added my brads. 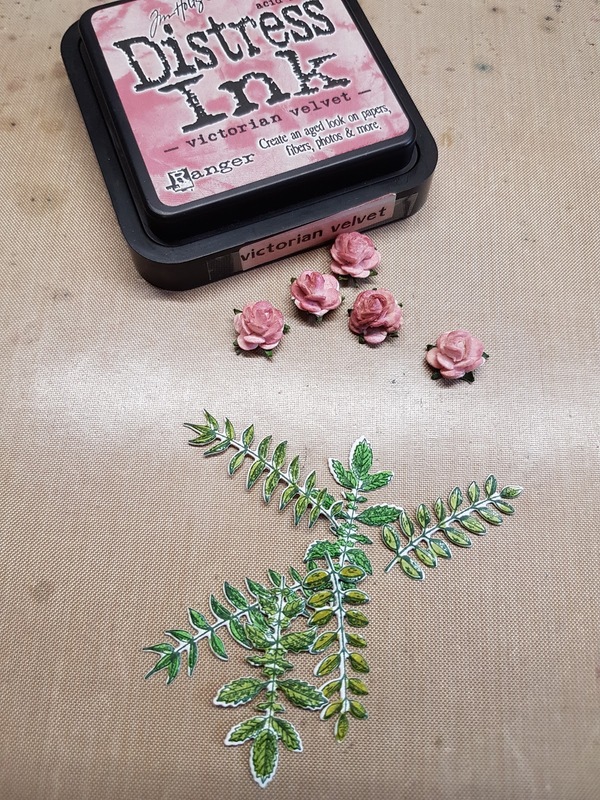 I cut some ivy with the Spring Greenery decorative strip from Tim Holtz and used the Green Fairy Wings powder to give it colour. 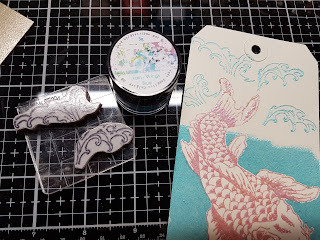 As I wanted add some more dimension to my tag, I decided to stamp the fish again and embossed it the same as the first time, but fussy cut it so I can mount it with some foam tape. With poor quality embossing powders it might come off when you cut close to them. This stays right where it should! 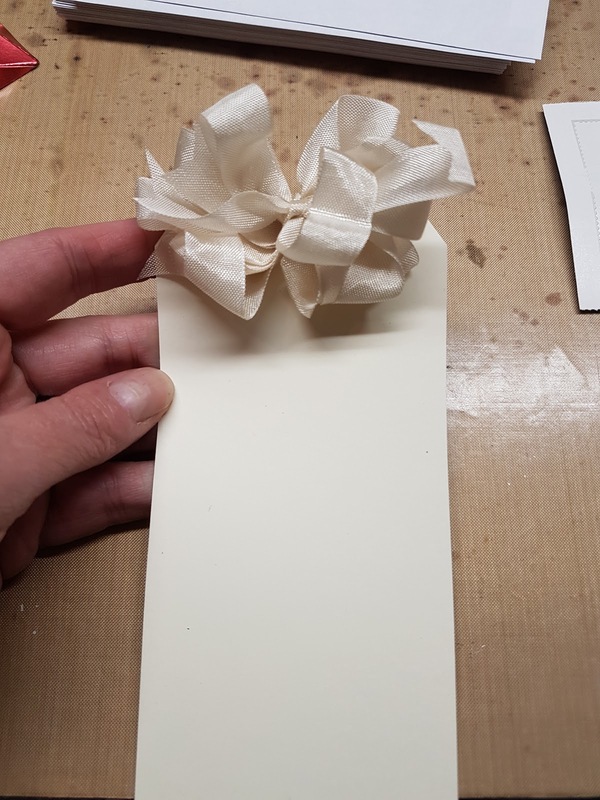 As the finishing touch I use a bow on my tags. I always customize them using my distress products, either ink, stain or marker. This Victorial Velvet cme closest to the Kiss of the Fairy colour of the koi. 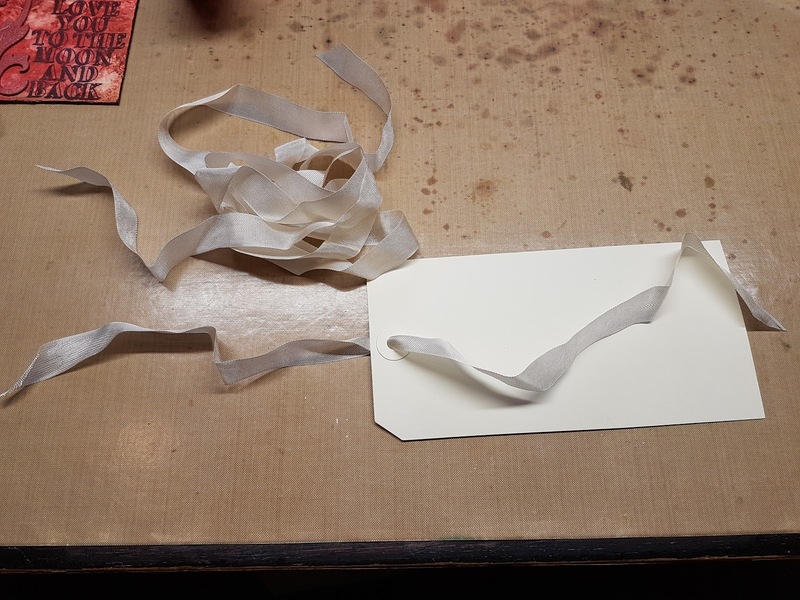 This is the finished tag. To show you that you can make something in a completely different style with these, I made a card using only die cuts and the embossing powders. 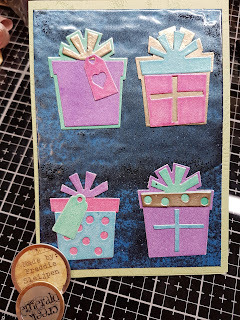 For the background I heatembossed an entire card topper with the Midnight Magic powder. A black and a warm blue metallic powder. 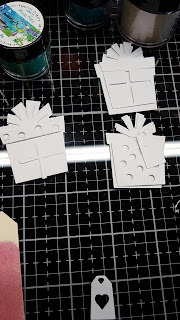 Then I cut the parcels with a Triplits set from Sizzix called Gifts. You can mix and match, so they are really fun with all these yummy colours. 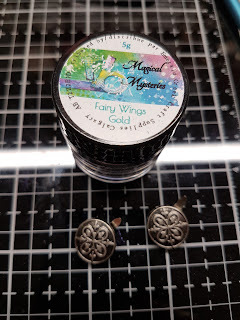 All the pastels and the gold from the Fairy Wings Kit were used. I had fun playing with these, and I couldn't choose which card or tag to show, so I did both. 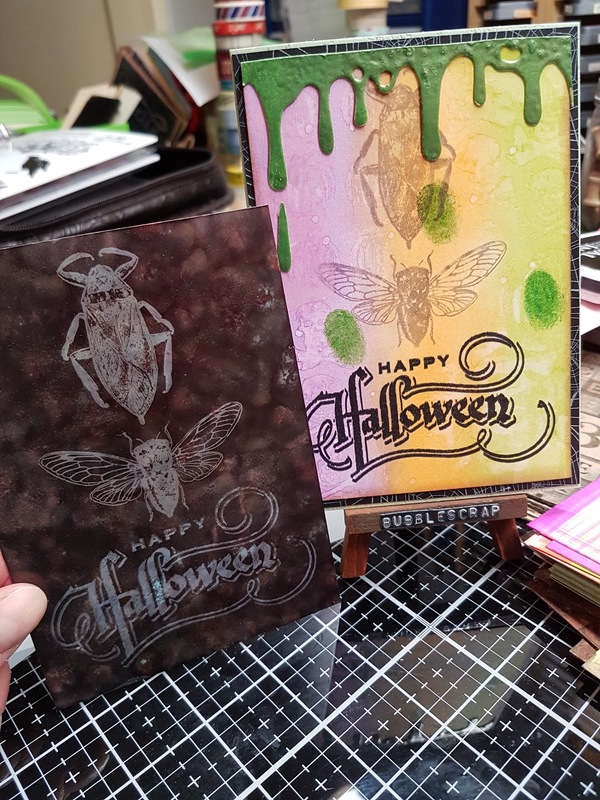 Last week I made a couple of Halloween cards using the Drip Edge Die by Tim Holtz. This week I used the die in a different way. 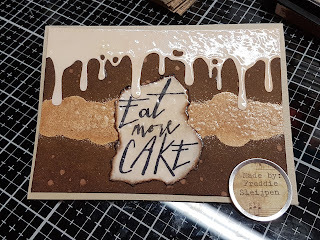 I made a chocolate cake card and a S'mores card, using this very die. This die made my head spin with ideas, from slime and blood to icing and melted marshmallows. 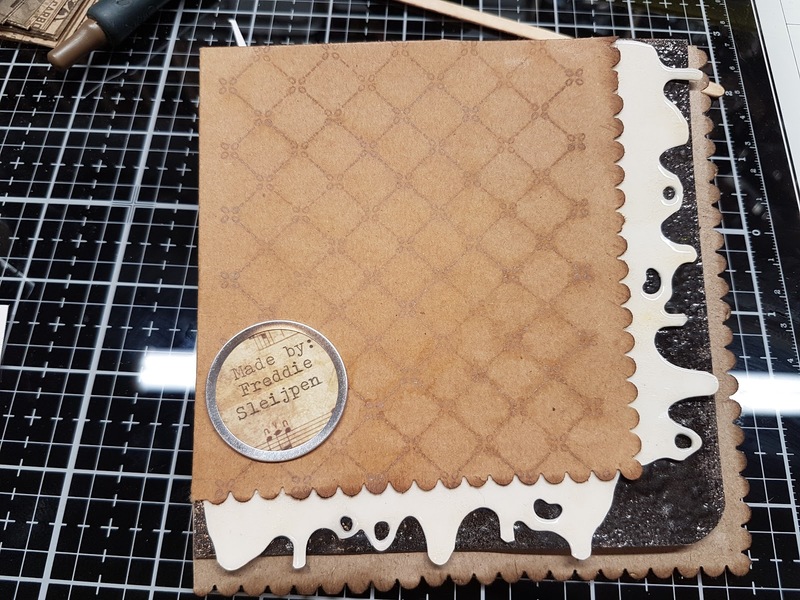 Here is a step by step tutorial on how I made my S'mores card. I will also do a recap on the other cards I made, but I didn't take pics while making them, so I hope you get the idea anyway. 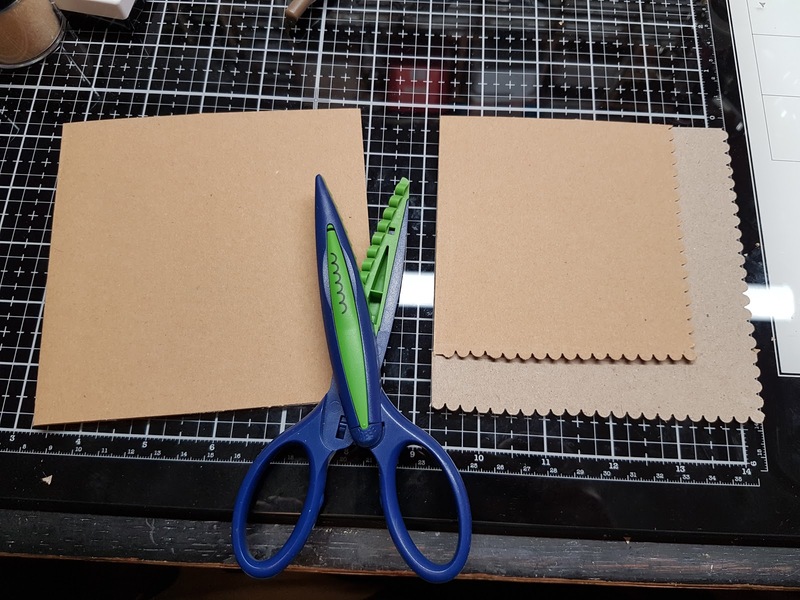 To create the look of the crackers, I cut a square Kraft card blank with a pair of scalloped scissors. I cut away more on the top to create a 3D effect. 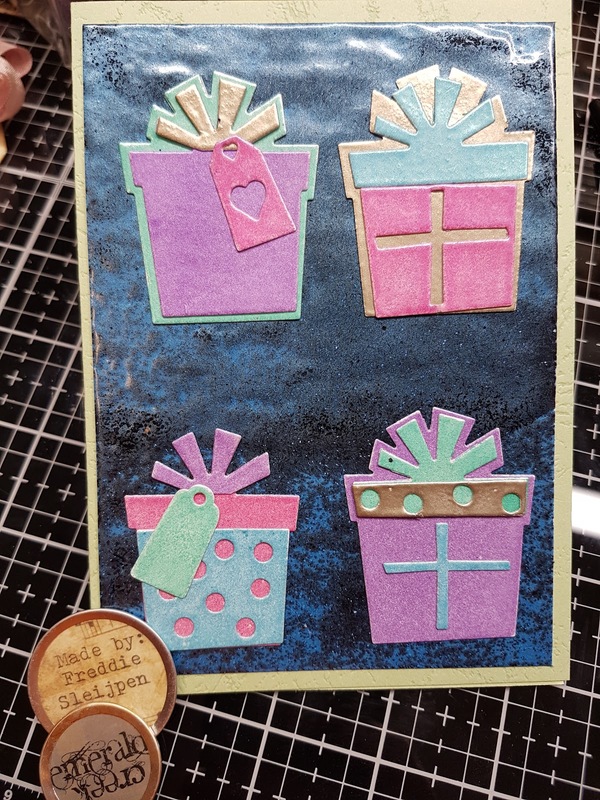 I used a background stamp and Distress Oxide to create a bit of the illusion of a cracker. 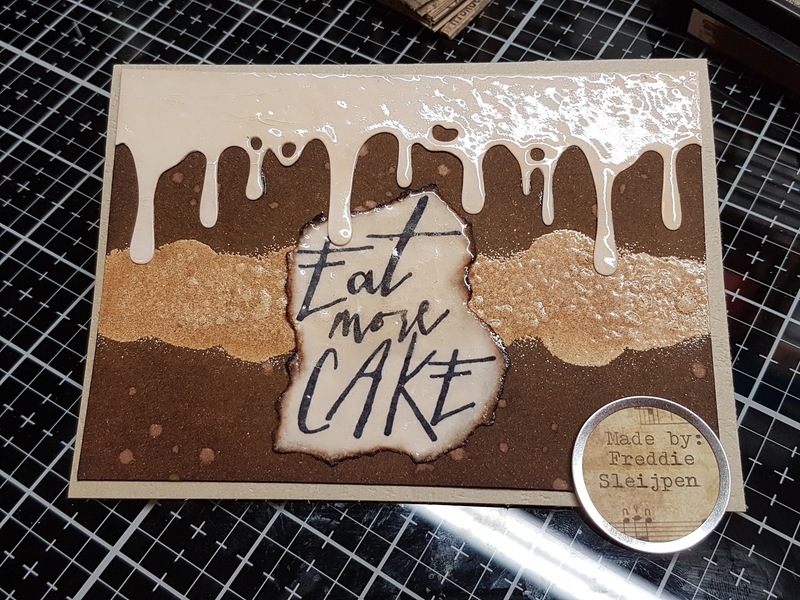 I inked the edges with Ground espresso Distress ink to give it a bit more oomph, and make it look less like a card, and more like a yummy cookie. What is a s'more without chocolate? 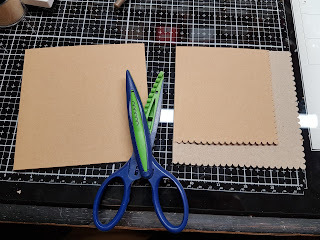 I cut a piece of brown card stock and covered the edges that will peep out of the card with embossing ink. 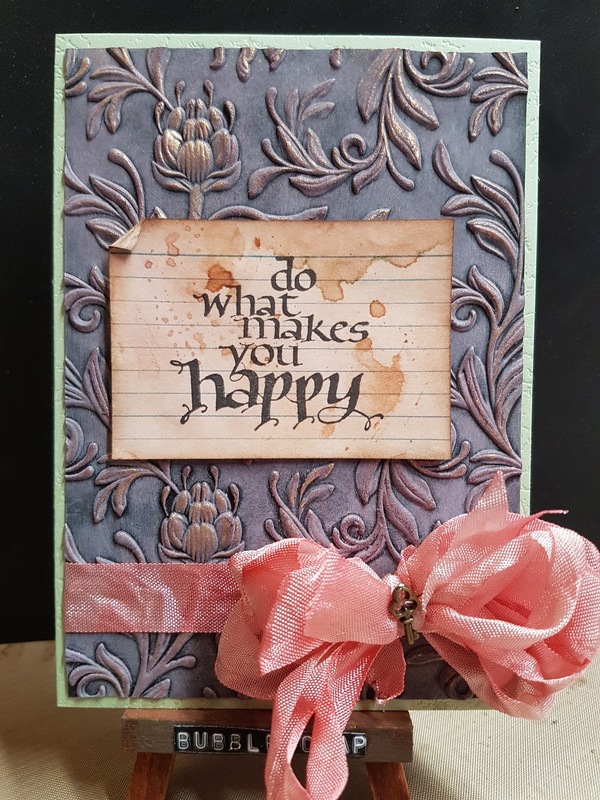 I heat embossed it with Just Java embossing powder by Emerald Creek Craft Supplies. I could have used the Chocolate Dream one, but I wanted to go for a darker shade, so I went for the coffee one. So this card will smell like coffee :-). 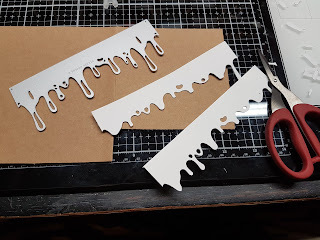 For my marshmallow I cut two drips and cut the longer drips off, so it looks more marshmallowy lol. I cover them with embossing ink and heat emboss them with Vanilla Sugar embossing powder, also from Emerald Creek. It smells divine and gives the drips a lush look. 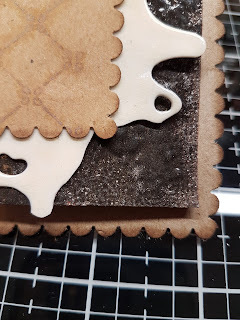 I glue the "marshmallow" strips on the back of the "top cracker" and then glue the "chocolate" over that. So when you close the card it looks like a s'more! And this is what it looks like. The metal tag is only there to prevent the pic from being pinched ;-). This is the cake card I made. I inked a piece of TH heavy card stock with ground espresso DI. 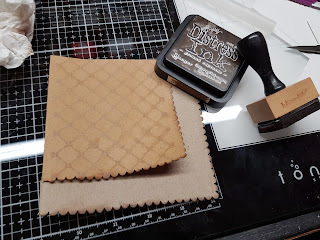 Then inked a part in the middle with an embossing ink dabber and heat embossed it with Chocolate Dream embossing powder. This will be the "filling" of the cake so to speak. 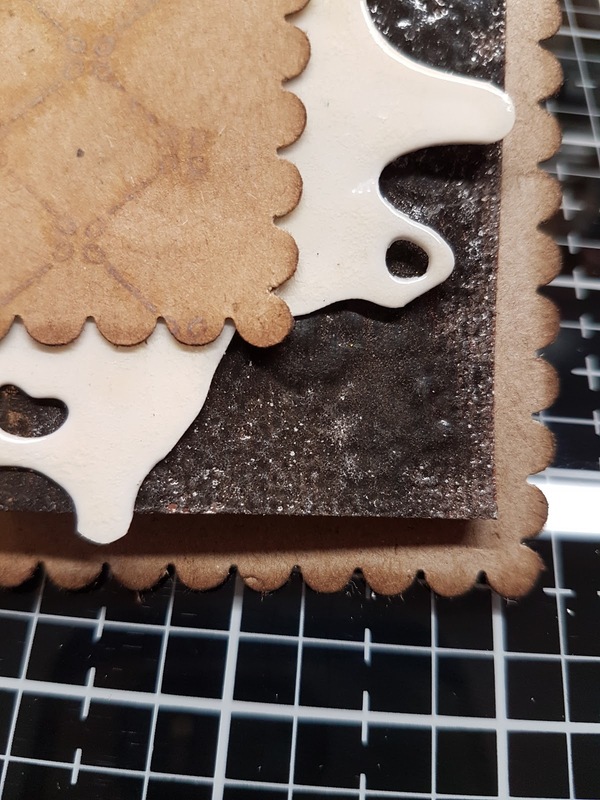 The icing is again the drip die heatembossed with the Vanilla Sugar. I spritzed the "cake" with water to give it some interest. The sentiment is a no brainer haha. 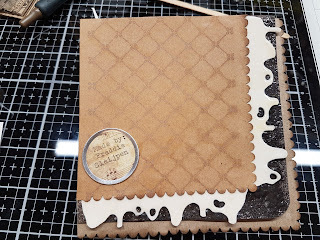 I stamped it with archival ink on white card stock and inked it with Antique linen DI and the edge with walnut stain DI. And there you have a paper chocolate cake! This slime card was the first idea I had with the die. 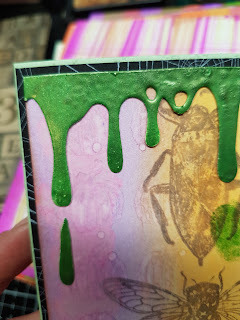 I stamped the bugs from the Entymology stamp set by Tim Holtz with lifted off Alcohol ink. The new Lift Ink from Ranger is the best thing since the Oxides! I inked over the images with Wilted Violet, Carved Pumpkin and Twisted Citron DI. I splattered some water and dried it. I inked the edges with walnut stain DI, like I do most of my projects. The sentiment I stamped with archival ink. I pressed my finger on my Mowed lawn DI pad and made the finger prints. The drips are heat embossed with Apple Martini green embossing powder. I just love the look of that slime!!! 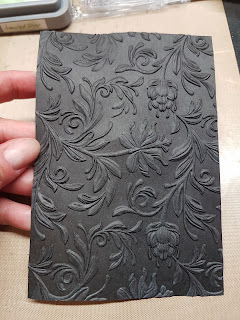 I stamped some cobwebs on black cardstock with picket fence DI and mounted it all on a card blank. And last but not least my bloody Halloween card. I inked a piece of Kraft resist Seasonal paper from Tim Holtz. 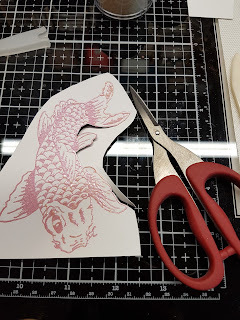 I finally gathered the courage to cut it into card topper sized pieces, after it has been in my stash for years. Again I used Twisted Citron, Carved Pumpkin and Wilted Violet DI. 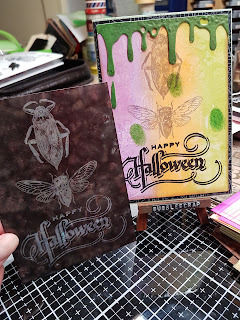 I used the Damask stencil and Black soot DO to give it more texture and I used the black with the word Boo from the Halloween Script stencil. 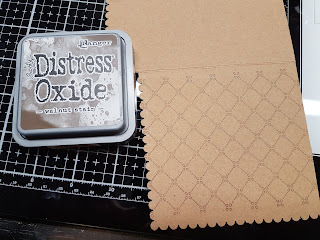 I used carved pumpkin Distress crayon through the pumpkin stencil and Antique Linen DC with the Skull stencil. 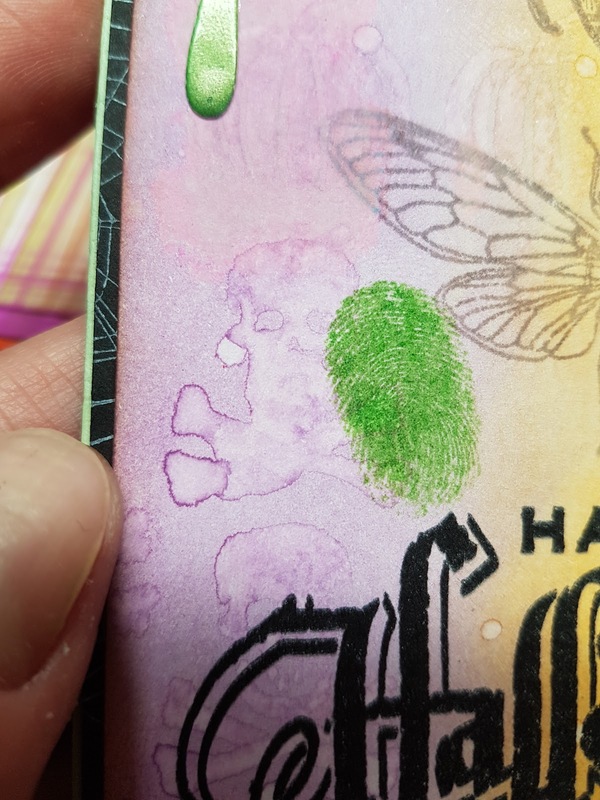 It gives the card a bit more texture. 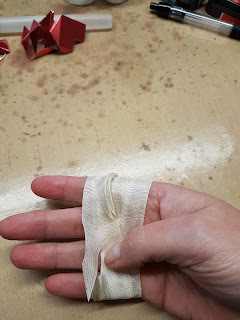 The drip I inked with Festive Berries distress ink and covered it with Spiced Candy embossing powder, which is a glorious transluscent red and smells like cinnamon. 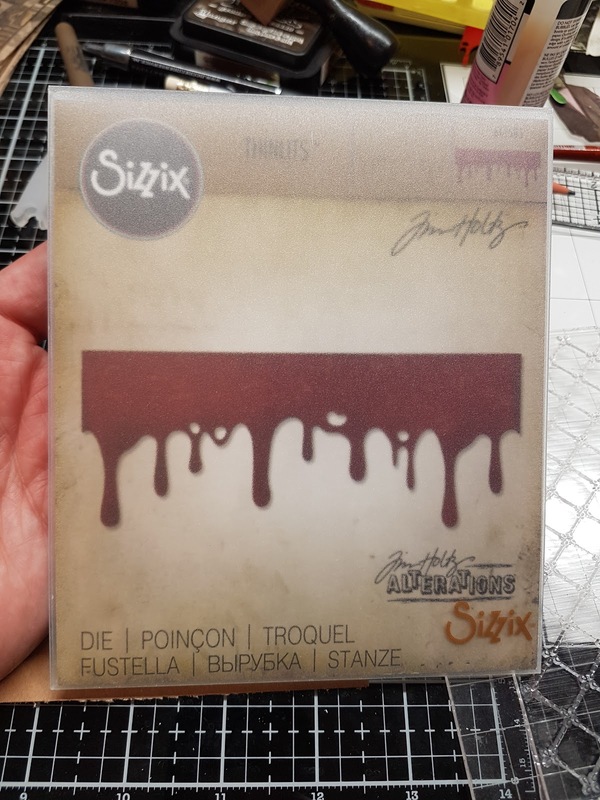 I used red paint to add some "blood" on the edges of the card and the finger prints. The ribbon I stained with my Halloween trinity Twisted Citron, Carved pumpkin and wilted violet Distress stain. I dried it and added the bow to the card. 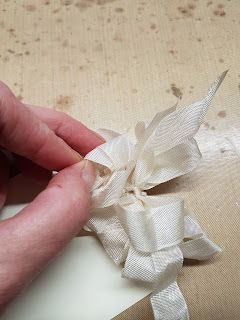 I have various bow tutorials on my blog if you fancy a look. I added a metal skull from my stash to the bow and still it was missing something. I had a skull laying around I made from paper clay and a mold, so I added that, after I gave it some personality with a distress marker, old paper I believe. The paper clay soaks it right up! 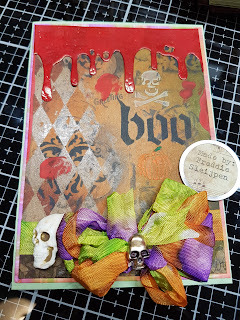 And this concludes my hommage to the Drip Edge Die by Tim Holtz and Sizzix. Thank you for taking the time to read my rather lengthy post. I hope to see you again here. 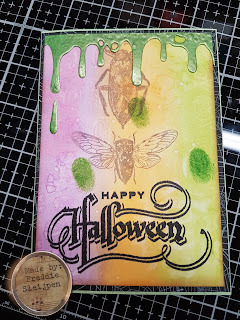 I finished an oozy gooey slime card for Halloween. I love halloween cards with either slime or blood on them 😁😁. 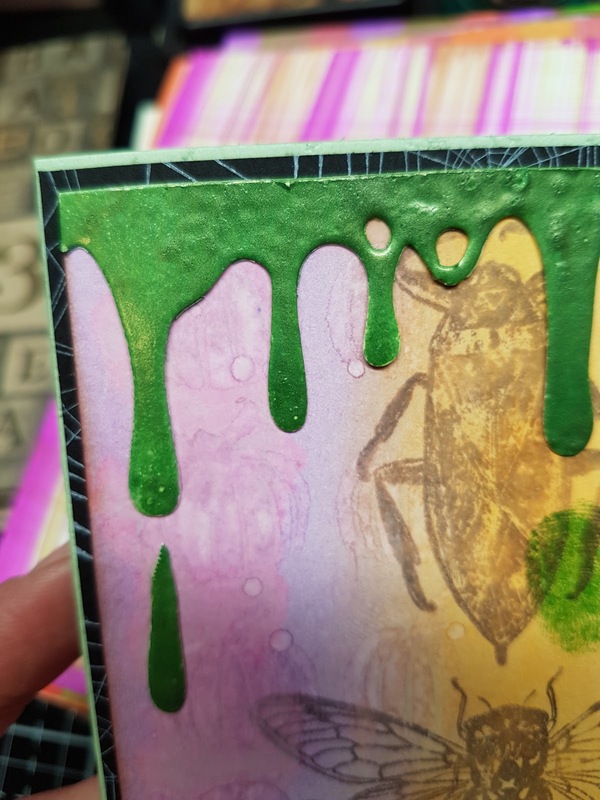 I stamped the bugs from stamp set CMS328 Entomology after I lifted them with Lift Ink from another background. 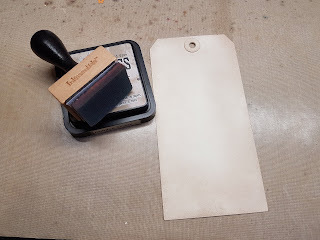 I stamped the sentiment from CMS240 Undertaker with archival ink. 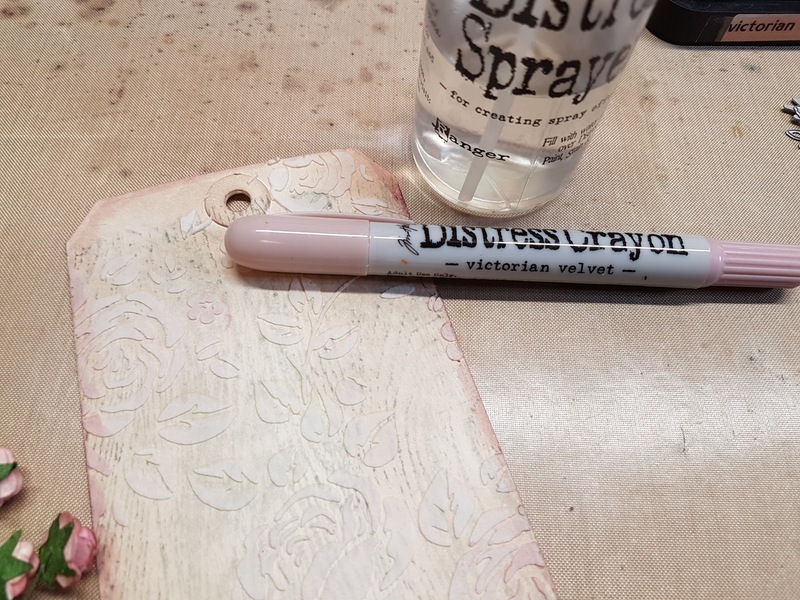 Then I inked my background with Wilted Violet, Twisted Citron and Carved Pumpkin DI. The edge I inked with Walnut Stain DI. 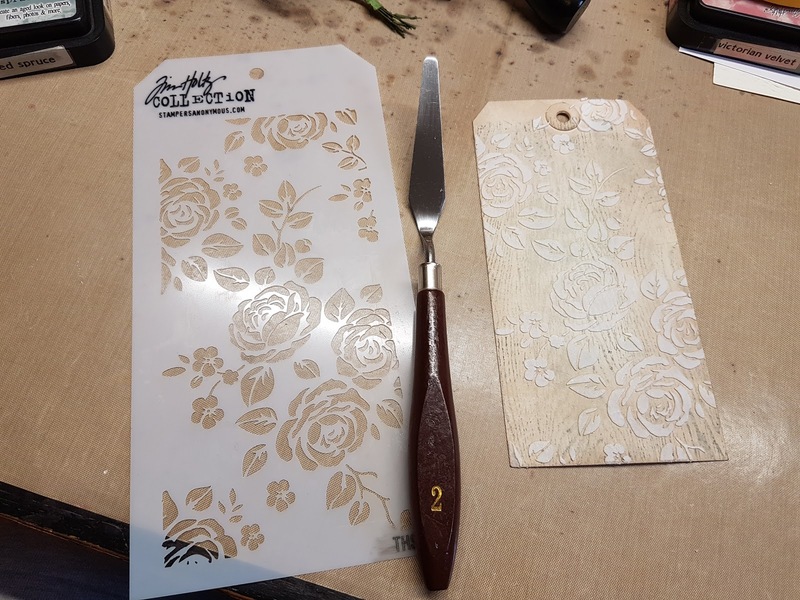 I put various stencils on it and misted with water to create a water mark like effect. 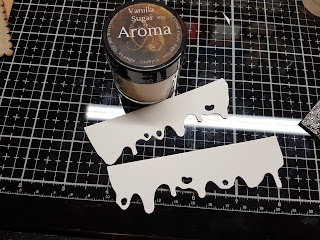 The drip I made using a die cut and heat embossed it green using Apple Martini embossing powder from the Aroma range from Emerald Creek Crafts Supplies. And used a piece of the cut off part to create that extra drip. Finally I pressed my finger on the Mowed Lawn DI pad and put some prints on the card. Yes I did that on purpose 😂😂. Thanks so much for stepping by. I hope to see you again some time. 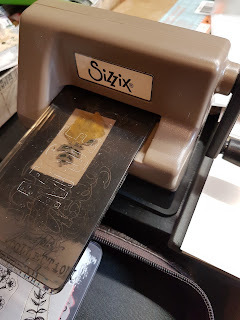 Tim Holtz and Sizzix came with a product that takes dry embossing to a whole new level. 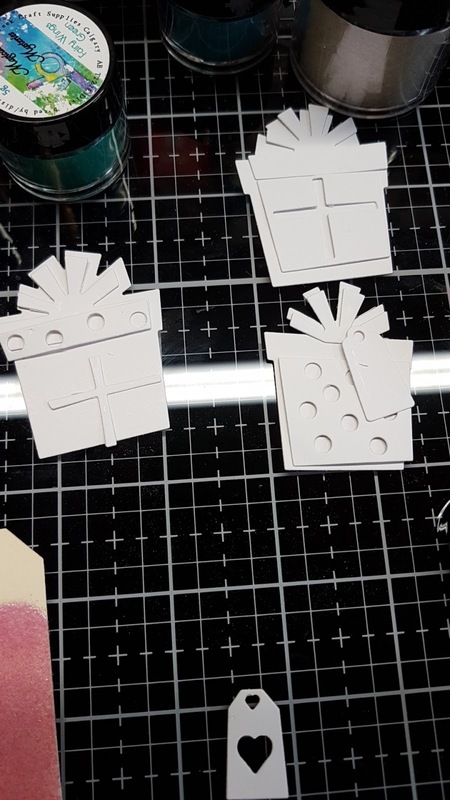 The 3D embossing folders. They just beg for some experimenting. 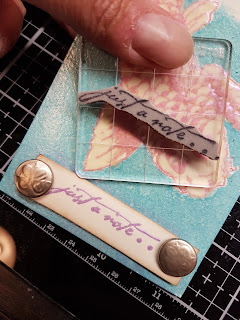 In the Tim Holtz Addicts group on Facebook, a lady shared a technique that just caught my eye. 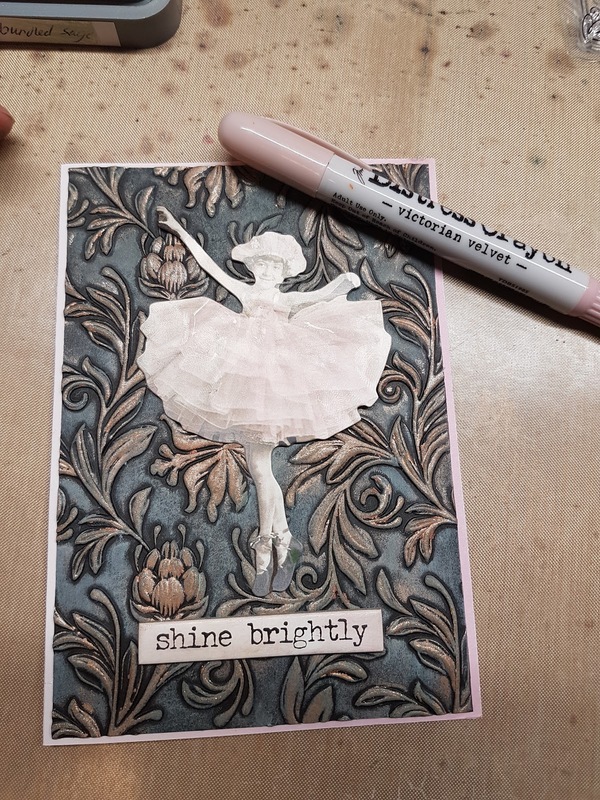 I made a card the other day and I fell in love. So I tried it again, only slightly different. On the first card I made, using this technique, I used a finger dabber for the oxides and I used gilding wax. 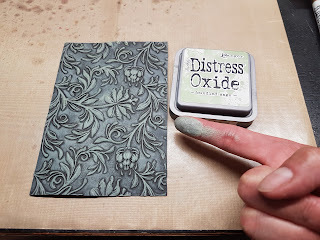 In this tutorial I used my finger for the oxide and the Antique Bronze distress crayon. I really love this look. This is the card I made with a finger dabber and gilding wax. 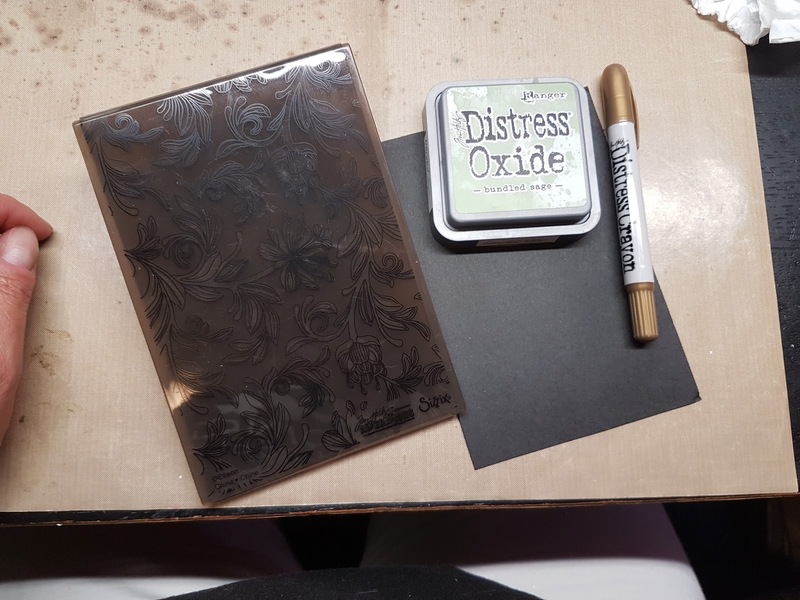 You need black card stock, the 3D embossing folder, Distress Oxide and a distress crayon. 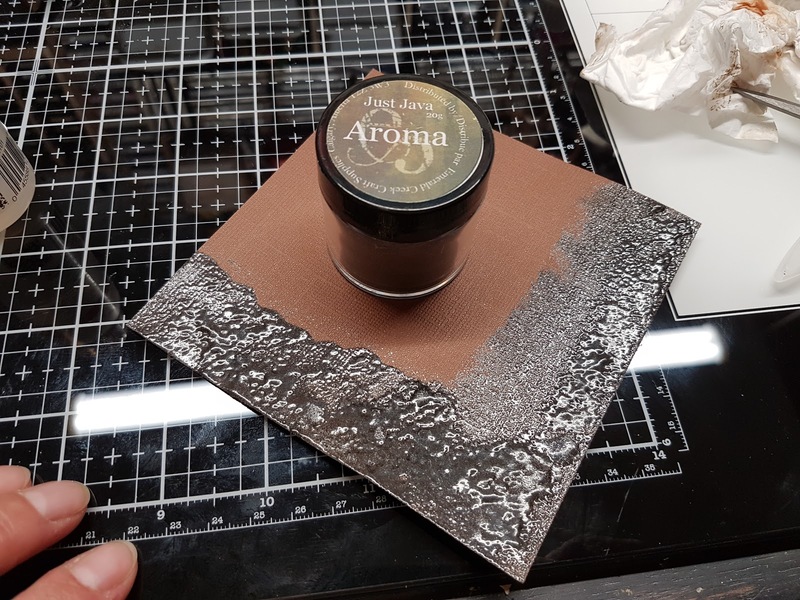 I went for Bundled Sage Oxide and Antique Bronze crayon. The "simple" embossed card is gorgeous all by itself, this 3D technique takes dry embossing to greater heights! 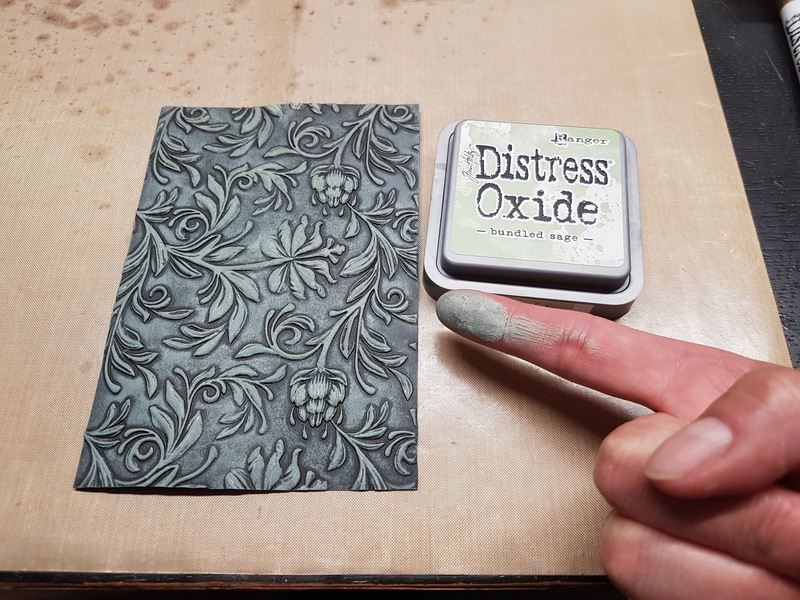 I swiped the pad over the card and rubbed the oxide with my finger over the whole surface. I scribbled my crayon over the raised relief and rubbed ober it with my finger. I love the combo of bundled sage and antique bronze! 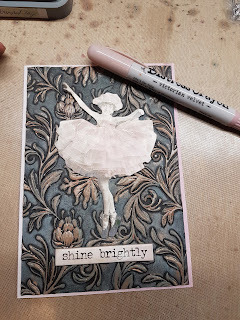 I coloured my paper ballerina with Victorial Velvet distress crayon, same with the sentiment. And here is the finished card again. 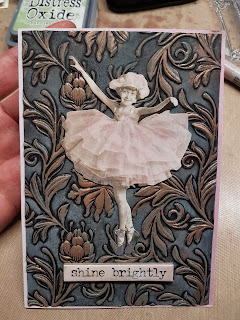 I stuck the embossed piece to a pinkish card blank to tie it all together. This is the project I made for the June challenge for the Crafts Dreamy Challenge Blog, and this will be my last one for this team. 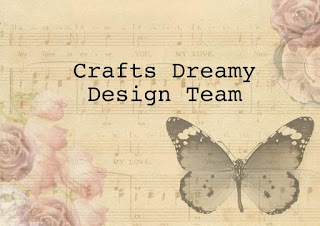 I have decided not to prolong my commitment to the Crafts Dreamy DT. I mainly craft when weather is colder, as in spring and summer I have too much to do in and around the garden. So I made the decision to step down and make way for an amazing fellow crafter. I really enjoyed creating for this amazing team and I might enter a challenge every now and again 😉😉😉. 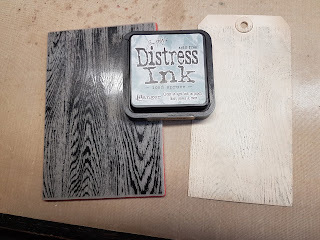 I inked the tag with pumice stone distress ink, and then stamped over it with the Tim Holtz woodgrain stamp and Iced Spruce distress ink. 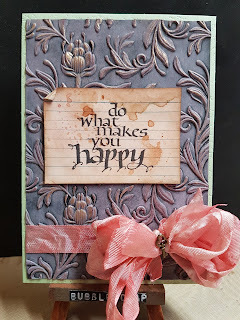 I used a TH stencil and embossing paste to create the floral background. 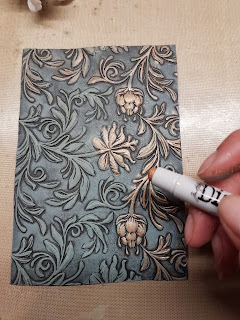 I coloured the edges with Victorian Velvet distress crayons to give it some more colour. I stained the tiny flowers and stamped and die cut the greenery with my trusted Sidekick. Everybody needs a sidekick!!! I stuck down some paper dolls and assembled my bouquet with hot glue. 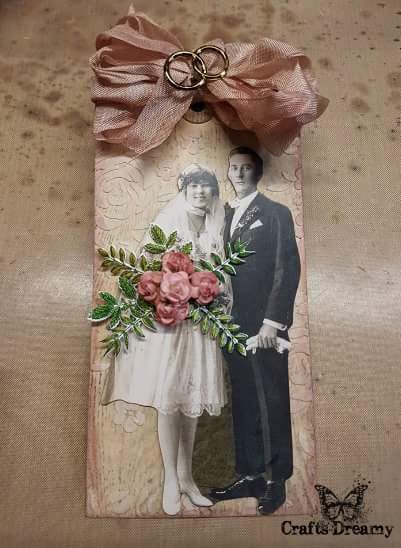 As a finishing touch I stained my ribbon and made the wedding rings look a bit more vintage with some alcohol ink. And this is the finished tag again. 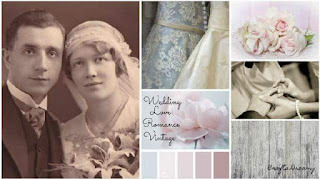 I love the look of the victorian velvet. Thank you for stepping by and taking the time to read my blog. Have a wonderful day, take care and keep your craft on! I started crafting in the summer of 2011. I am inspired by Tim Holtz, amongst some other crafters. 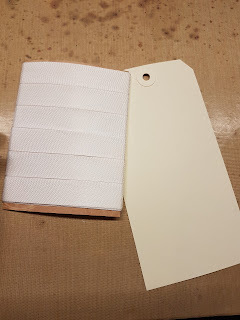 I mainly work with manila tags but also like to make cards, mini albums and the odd canvas.